This is a non-standard Expert Advisor, which can't be attributed to any particular type. It adjusts to the current market situation. The EA uses time and price information, trades using pending orders. The number of trades can differ from a few deals per month, up to dozens a week, it all depends on the current market conditions, settings, and the number of financial instruments traded. VPS is required for stable operation, minimum deposit is 1,000 units of the base currency. Timeframe does not matter. The RA places two opposite pending orders, STOP or LIMIT depending on its input parameters. Orders are modified following the price based on the timer in seconds. When one of the pending orders triggers, the other one is deleted. If the EA is running on several currency pairs with the same magic number, all inactive pending orders are deleted, and the EA then works only with the pair, where a position was opened. If different magic numbers are used, the EA works with each of the pairs separately, i.e. when an order triggers for one currency pair, pending orders of other currency pairs are not deleted. If one position is in the market. The first modification of stop-loss is the breakeven level, then point-based trailing stop is activated and works till a distance specified in the EA settings "TrailingStop". After passing the distance, trailing by previous Hi-Lows of bars is enabled. The timeframe and the number of bars for finding the extreme values are specified in the EA settings. The switching trailing stop allows to maximize the profit. If several positions are in the market. All deals are closed by a common profit. Some deals can be closed with a small loss, but the total profit of closed orders is always greater than the loss. All positions are closed by trailing stop. Position closing prices may differ, depending on the speed of order execution on the broker side. IndentHiLow – a distance from the Hi-Low price to set a stop loss. This is the third Ea I bought, made ​​by Vladimir . The first one was the Supernova the second, Martingale Plan B,these in real account. 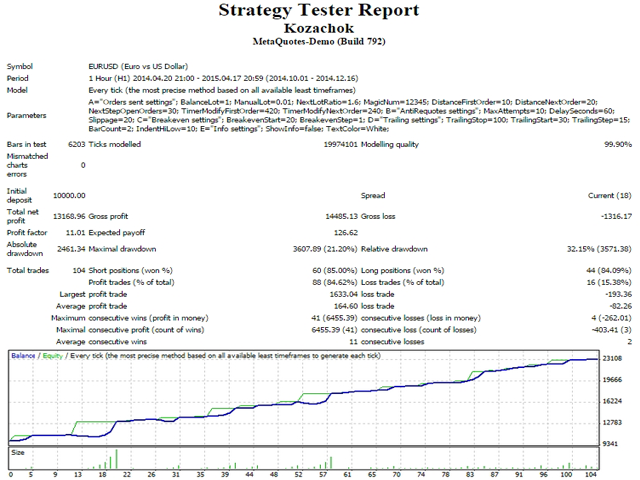 Others I have in demo account are , Grid , Grinder , Moneystrategy and Printer , all with good results. Added check for the presence of orders when trading on several instruments. Added additional check for the presence of orders when trading on several symbols.